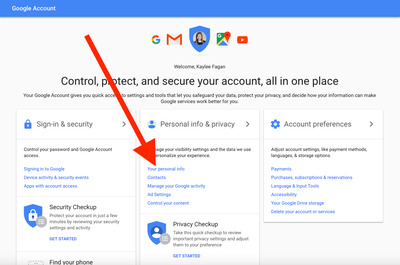 If you’ve ever worried about what would befall your Gmail, photos, documents, YouTube videos, and other digital data in the event of a terrible accident or your own death, you’re not alone. 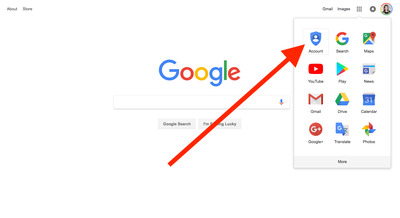 It’s a little dark to think about, but the good news is that Google has your back. 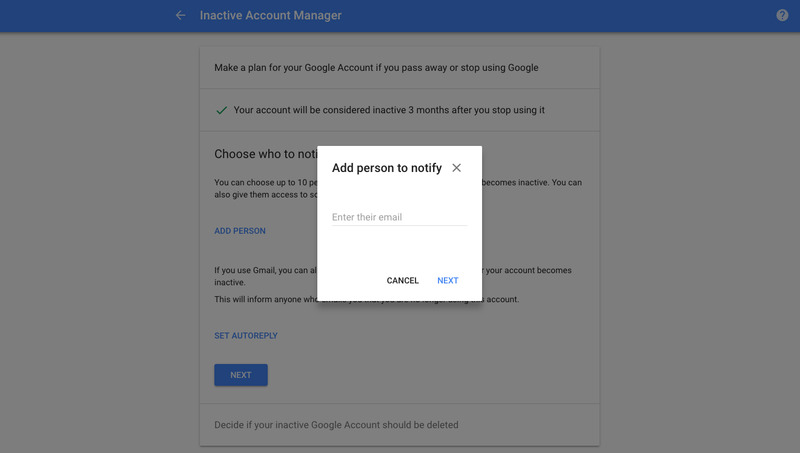 The service offers a feature that will bequeath your Google account and all of its contents to up to 10 pre-selected trustees, and even let you set your account to self-delete after an extended period of inactivity. 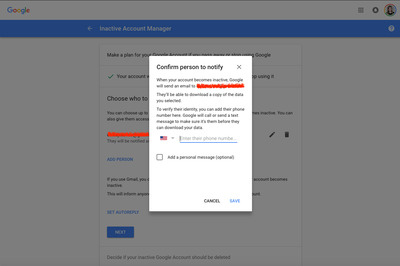 To get started, you’ll want to make sure you’re logged in to your Google account, and find your Account settings. Click on the tile menu, and “Account” should be the very first module in the drop-down window. 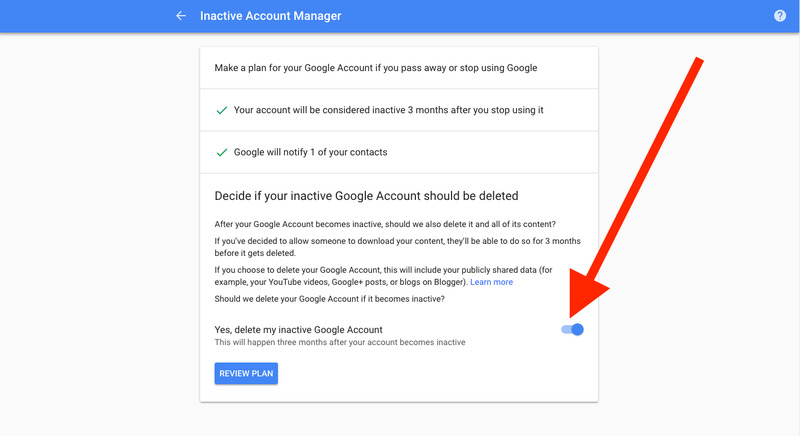 Google doesn’t really advertise this feature, and bury it pretty deeply among the dozens of other account customisations, making it feel like the morbid needle in a settings haystack. 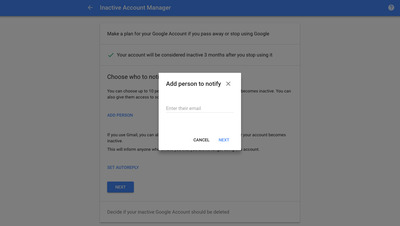 From here, you’ll have to scroll almost all the way down the page, until you see the section titled “Assign an account Trustee.” On the right side, you’ll see an entry to the “Inactive Account Manager.” Go ahead and click “CHANGE THIS SETTING” to set it up. 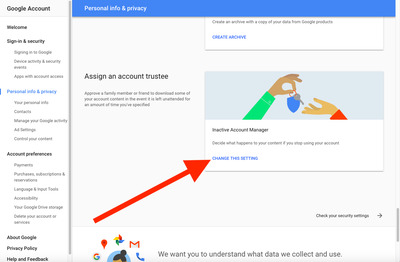 This page doesn’t include any mentions of the word “death” or establishing a virtual will of all your Google data, but trust me, that’s what we’re doing. 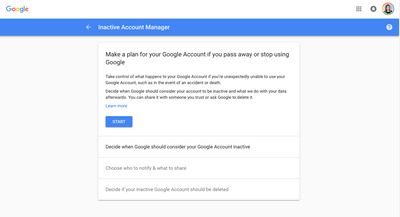 This tool basically works as a spare key for your trustee, in the event that you don’t log in or interact with the account for an extended period of time. 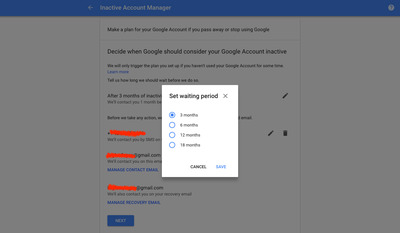 The first step is to decide how long you would like the account to wait for you to log back in before declaring it “inactive” (and assuming you’ve died). 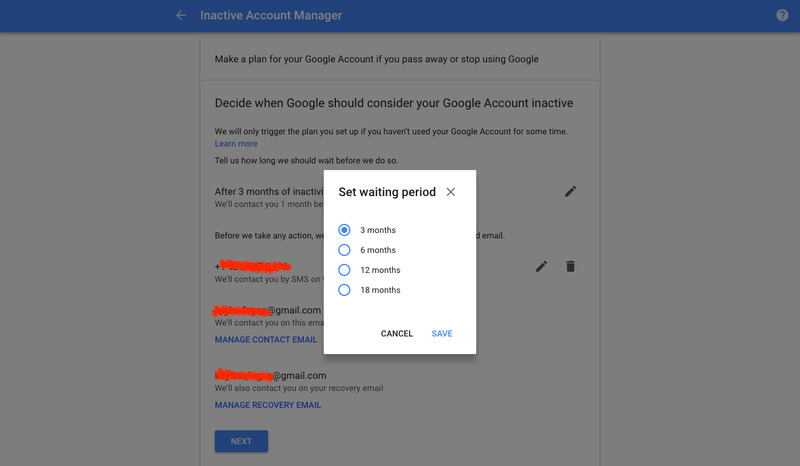 I chose to set my account to the shortest “waiting period,” because my lifestyle is such that if I go three months without checking my emails, there has very likely been a horrible accident. 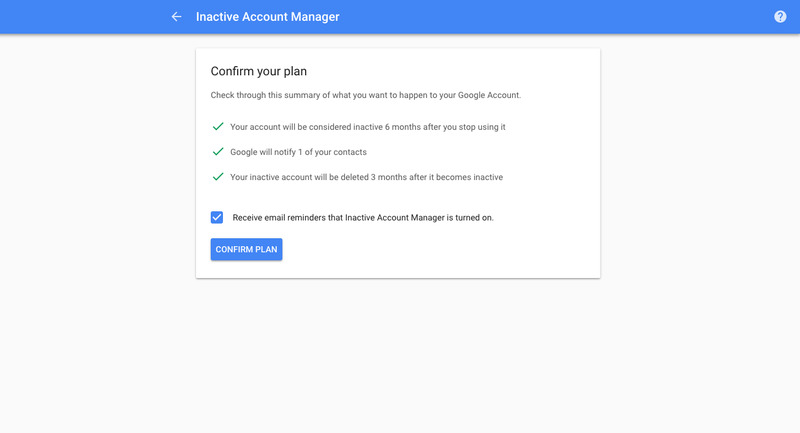 Although, if you’re not a frequent email user, or anticipate that you might take an extended remote vacation in the near future, you might want to set a longer waiting period. 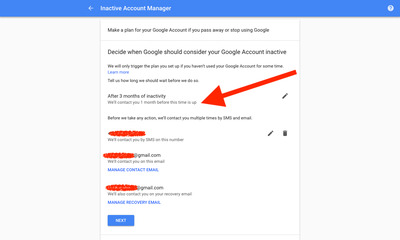 If Google has noticed that you’ve gone inactive, it will attempt to check in on you by sending emails and texts to all of your backup contact information before the actual timer runs out. In my case, that means I’ll be notified after two months of inactivity. Now you’ll enter the email address of the first person you’ve selected to be your trustee. 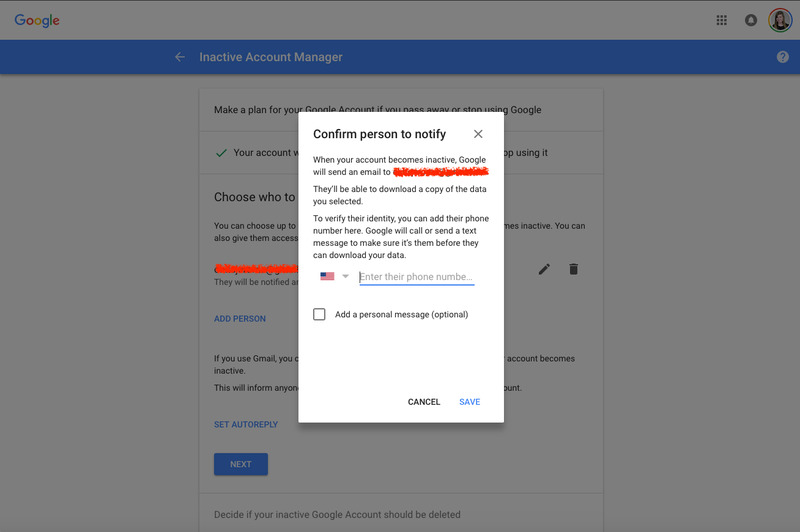 It doesn’t have to be a Gmail address. I recommend choosing someone responsible whom you would also trust with your real-life possessions in the event of a tragedy, like perhaps a significant other, a sibling or family member, or a close friend. After entering your trustee’s email, you’ll be able to select exactly which Google apps they will gain access to upon your passing. 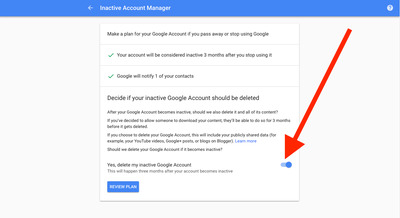 For example, if you want them to have access to your YouTube videos and Photos, but not your calendar events, you can make that distinction. 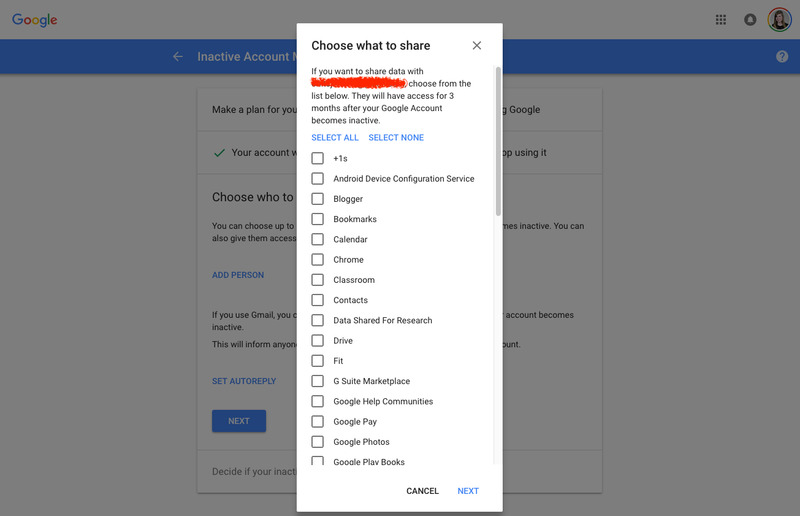 You can assign up to 10 trustees to your account, and give each access to a different combination of your Google apps. Next, you’ll confirm your trustee selection by adding their phone number. The tool also lets you add a personalised message to be delivered to them, in case you have any special instructions or reminders that need to be sent from beyond the grave. Next, you’ll be given the option to set a generic message that will be automatically sent to anyone that emails you after your account goes inactive. 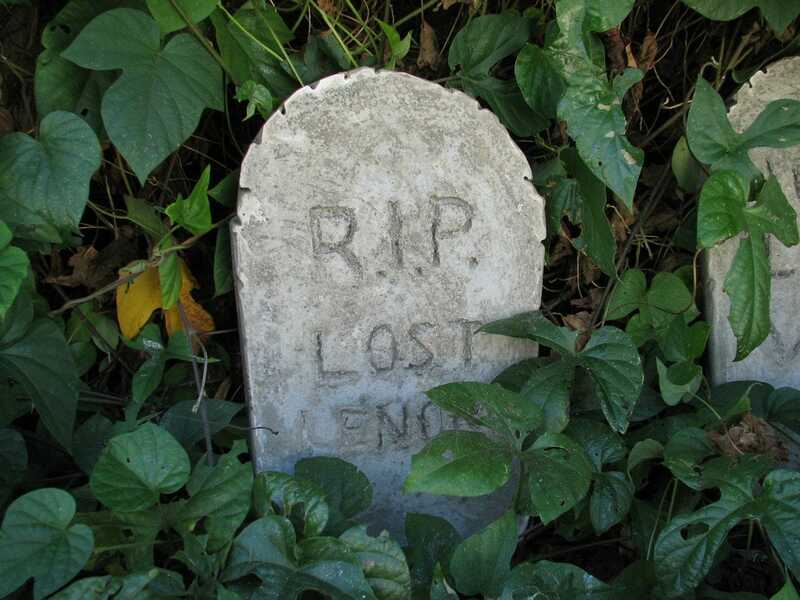 “Sorry, Kaylee won’t be responding to your email because she is no longer alive,” seemed a little dark to me, so I opted to skip this step. 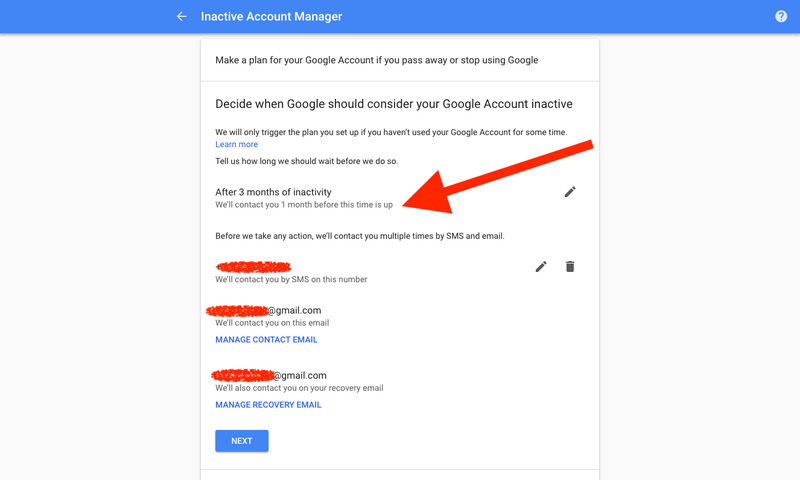 Lastly, and arguably most importantly, you can choose to set your Google account to auto-delete itself 3 months after contacting your trustees. 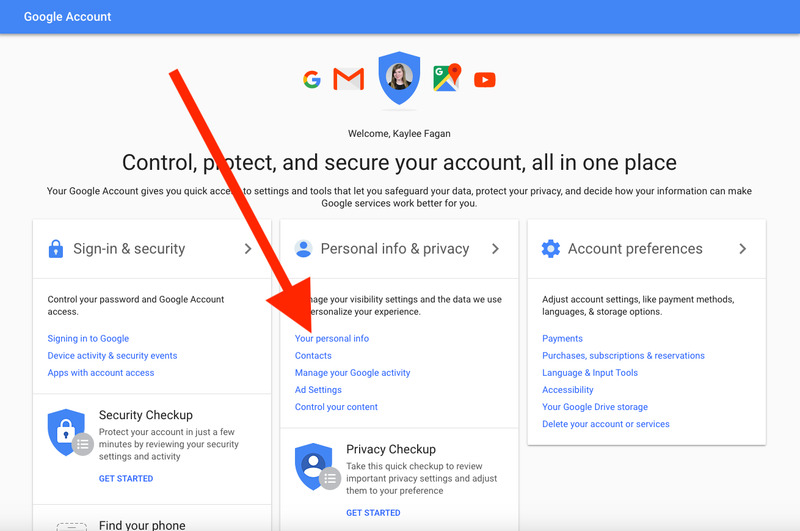 This feature gives your loved ones plenty of time to off-load your data before the timer runs out, and ensures that your account doesn’t end up in the wrong hands now that you won’t be using it. 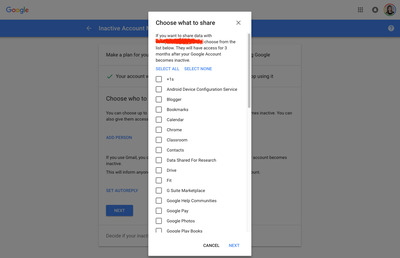 This feature is turned off by default, because it includes deleting all of your publicly shared data, like YouTube videos. 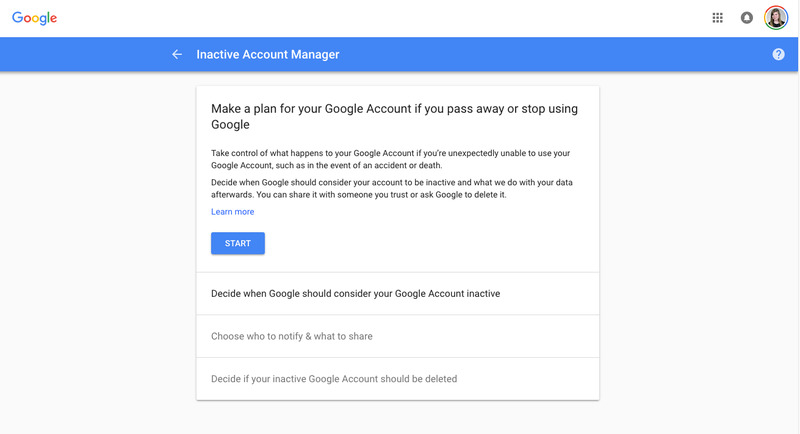 Personally, I don’t want my data to outlive me by more than a few months, so I’m happy to have my Google account self-destruct. At the very end, you’ll be asked to confirm your plan, and voilà! 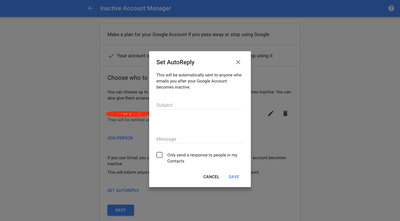 The tool will automatically send you occasional reminders that it’s turned on, but you can opt-out of those emails if you don’t like to think about your own mortality every few months. 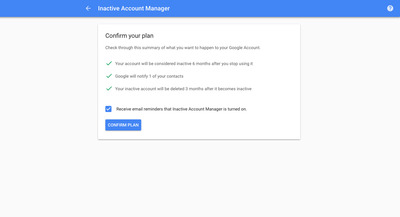 Don’t worry, you can change your “Inactive Account Manager” settings whenever you like, just in case you need to scornfully write an ex-loved one out of your virtual will and testament.